Tiling floors in a darker tile and having white tiles on the walls always looks great. Add a vertical strip of decorative tiles in the shower and it will change the look and the feel of the bathroom. If you’re completely ripping everything in the bathroom to replace with new, try and keep your plumbing in the same place. You will save thousands of dollars if you are not moving where your shower, toilet, bath and vanity previously lived. Once everything is ripped out, add a few extra noggins to your frame. It’s very frustrating if you want to add towel rails and hooks and you can't screw them in, because there is nothing behind the plaster for them to adhere to. If you have had water damage in the bathroom, you may need to re-sheet the walls with water resistant board that you waterproof before you begin tiling. Make the shower bigger to give your bathroom an instant glamour upgrade. Everyone loves a double sized shower and for the sake of spending an extra $1-$2,000, it will leave a lasting impression. If the bathroom is in relatively good shape and the shower and bath are good, but it just looks a bit dated, keep it simple by just replacing the vanity with a newer, modern version and installing a fancy tap and big, square showerheads. For a very small budget, this can really add style to your bathroom and make it look modern and like new. 8. 2 Sit in a bathtub before buying it. A clear shower screen is a winner. It's also worth considering a frameless shower screen or if you prefer the hotel-style wet room looks no screen at all. Now there are sliding screens available which are a fantastic space saver. 10. If you can barely move in your bathroom without bashing your elbows, here are some tips to at least make it feel more spacious. If you’re renting a home with a tiny bathroom, or just don’t have the cash for major renovations right now, there are tricks you can use to make the space look and feel bigger. Mirrors add depth to a room and enhance the light – if there’s already a small mirror, replace it with a larger one. Clutter exacerbates the problems of a small bathroom. Remove the mop, clothes basket, magazine stand and old products – you really don’t need a dozen half-empty bottles of conditioner and shampoo around the edge of the bath or on the shower floor. Can’t bring yourself to throw them out? Store them out of sight. If the cupboard under the sink doesn’t have shelving, create your own using wire storage racks with containers for small items. Consider adding a shelf over the door – it’s handy for extra storage and almost invisible to the casual glance. For things you use every day, try glass shelving or wooden spice racks painted to match or contrast with the walls. Hang towels on racks or hooks on the back of the door to remove them from view. You can create more space in a small bathroom by renovating, using different fittings and changing their placement. 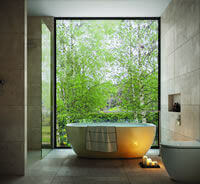 • If you want a bath, look for a small, deep model and incorporate it with the shower. • A clear shower screen offers more space and light than an opaque screen or shower curtain. 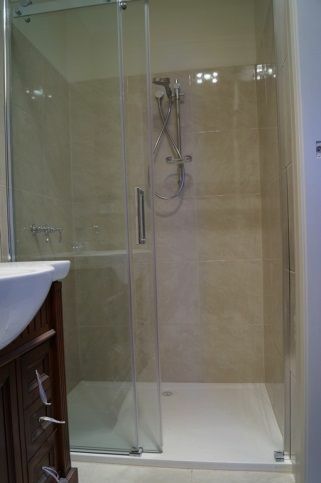 Likewise, a frameless shower screen reduces visual barriers and can work brilliantly in a small bathroom. • Wall-mounted washbasin and toilet fittings create an illusion of space by exposing more floor area. • Light-coloured walls and floor tiles can make the room appear larger. If the wall is partially tiled, choose tiles similar to the paint colour to reduce horizontal lines. What’s outside the bathroom? A full-length window that looks on to a (private) garden dramatically increases not only your sense of space, but potentially the value of your home. Alternatively, consider a wall of opaque glass tiles to flood the room with light. A small bathroom isn’t necessarily a bad thing – think of the energy you are going to save on heating in winter. Clear out everything but the essentials, get rid of the clutter and, if you can, install fixtures that suit a cozy space.